If you read any of the automotive blogs, you've probably heard about the upcoming RWD Toyota/Subaru coupe that's supposed to come out. Thoughts of a Subaru-powered AE-86 remake have been dancing the heads of sports car fans (and drifting enthusiasts) since the news of the car hit the Internet. 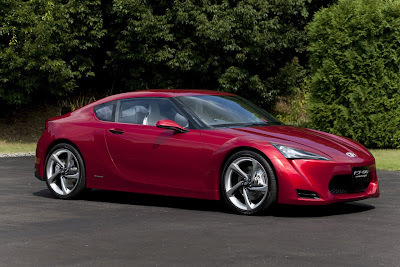 Well, behold the Toyota FT-86 Hachi-Roku. So, the FT-86 is a tad shorter than the 370Z, but longer than a Miata, although the 86's wheelbase is close to the 370's. Sounds pretty intriguing to me. FYI, for comparison's sake, the Honda Fit is only about 2" shorter and narrower, and has a 3" shorter wheelbase. So, the FT-86 won't be very large. Fhe FT-86, unlike the 370Z and Miata, is supposed to be a 2+2, so you can get four people into it. The FT-86 will be powered by a 2.0-liter Subaru "boxer" or horizontally opposed four cylinder. This concept will bow at the Tokyo Motor Show, and will allegedly go on sale in 2011. Finally some adrenaline from the Big T. More pics over at Autoblog.com. I like the looks of this car. As long as they don’t screw it up too much and keep it basic and cheep it will be a hit! I concur. If they can keep the price right around $20,000, it should do well. Might even be a good competitor against the Genesis, too. Depending on the price, I'd rather have a base Genesis coupe.